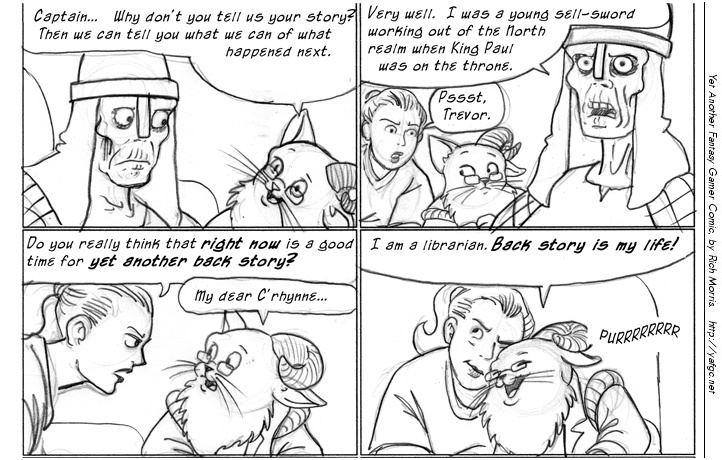 That is quite possibly the most Trevor-and-C’rhynne moment I’ve ever seen. Loving it. Loving _them_. What a pun of a comic…. I–‘m kinda confused about the timeline. About how long was the 7th age? I do have a question though: Just how long was the 6th Age? I was confused about it before as well. Then at one point I found the start of the 7th Age, at least if I am not mistaken. It is at Strip 1000, right after the events of Lich of the Ring and The Axe in the Rock. My guess would be it starts with the coronation of Runt and ends with the destruction of the Black Mountain. Well, not exactly on those days, but with those years. Also helps give them time to think. He is Gandalf, but cuddly! I’m now picturing Trevor spreading little arms in the hall, teasing C’rhynne with a "You shall not pass!" — and C’rhynne eyeing him, smirking, and…stepping over him with very little difficulty. Not quite breaking the 4th wall. Just bending it to near-breaking. This how librarians live life on the edge. Pardon me, did someone order Exposition, extra-large? – Why, yes! It just so happens that I love exposition! From a storytelling point of view, it lets us see events outside of the normal story, with the added bonus that if later tellings are different, well, Rich can play the "unreliable narrator" card. I like it, by the way. I try to avoid that issue by keeping track. I’ve got a mammoth document of the annotated history of my world. Well, this proves Trevor isn’t "full kitty"–cats, from what I’ve seen, pretty much live in the now. And as a librarian, I can agree that this is 100% true–it’s all about the back story. I would probably use *historical context* myself, but it amounts to the same thing. I wish we could edit posts here. How can you not love Trevor? I think Trevor just made a most delighted chirp, rubbed mismatched palms together, and is humming to himself, forming all the questions to ask the newly-raised….what a splendid idea. I know that look on her face. She’s thinking, "Yep, right in the eye; better get my allergy drops out… "
And the bonus is… you get the backstory from the person having lived it! You can’t resist the purrs.